You should be seen by a dentist that believes that treating you as a person is as important as treating your teeth. 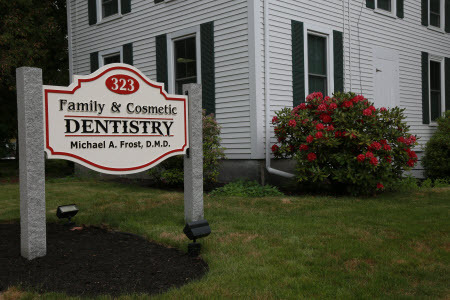 Over the years, Dr. Michael Frost has formed relationships with families in our community, providing the care they need to achieve long-term dental health and cosmetic appeal. Offering treatment that is both personable and personalized, our practice serves patients in Cumberland, Yarmouth, North Yarmouth, Falmouth, as well as the surrounding areas. It is my great pleasure to announce that my son, Dr. Gregory D. Frost, has joined my practice on a limited basis Saturday mornings, by appointment only. Dr. Frost is a 2016 graduate of Tufts University School of Dental Medicine. 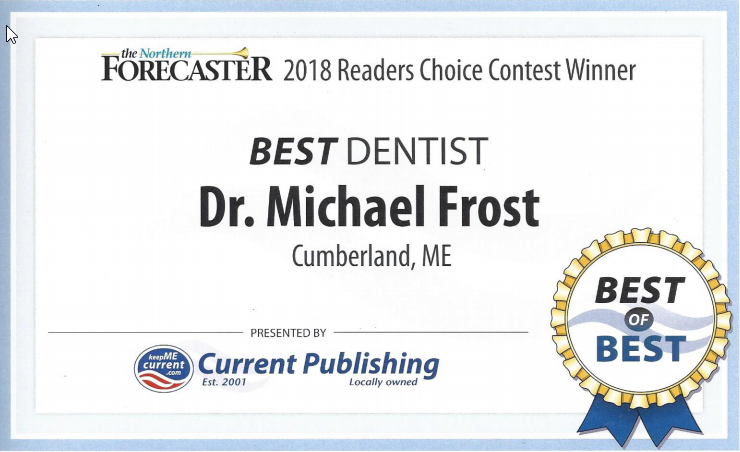 I am pleased to say that he shares my dental philosophy of compassion and providing the highest quality of care for our patients. It is our philosophy and privilege to offer a range of preventive, restorative, and cosmetic services for the entire family. Dr. Frost enjoys promoting optimal dental health for children and adults alike, seeing patients throughout their lives, beginning as soon as they get their first tooth. Whether performing a cleaning, advising on proper home care habits, or conducting a procedure to restore dental function and appearance, Dr. Frost and his staff are committed to addressing patient needs as completely as possible. In order to ensure we are providing patients with the highest quality of care, we incorporate the latest techniques and technologies into our practice. Through our advanced diagnostic technology, including digital x-rays, intraoral cameras, and CariVu®, we are able to develop precise and individualized treatment plans while preserving our patients’ overall wellness. At our Cumberland dental practice, we value your friendship as much as we value your health. Whether you’re coming through our doors for the first time or have seen our dentist for years, you can expect the same level of compassion at every visit. The core of our dentist’s care is providing the same level of care for you as he would want for himself. We understand that coming in to see a dentist can be stressful on its own, which is why we emphasize building relationships with you and your family meant to last as long as your oral health. Contact our Cumberland Dentist Today! Dr. Frost welcomes the opportunity to help you and your family gain years of beauty and service from your smiles. To learn more about the services we have available, call and schedule an appointment today! Our Cumberland practice is located on Main Street, situated between Greely High School and Atlantic Federal Credit Union, easily accessible for patients whether coming from down the street or from communities throughout the Greater Portland area. We encourage you to contact us with any questions or comments you may have. Please call our office or use the quick contact form below. Please do not leave messages for emergencies/urgent care or to cancel or change an appointment. For these services please call the office directly. E-mail requests will be answered Monday-Thursday only.